A few weeks (maybe months? I am so far behind) ago, I got an email from Ben to check out some videos on Sorted. I did, and they are great. They were even so nice that they sent me their cookbooks to check out. I want people to get into the kitchen and make their meals from real food. My goal is to teach people how to cook, that is why I take the time to take step-by-step photos. I want people to have confidence in the kitchen, and play around. Cooking is fun. I always get so sad when people tell me that they really do not enjoy cooking. I understand not loving the everyday dinner cooking, because that can get old for sure, but my time in the kitchen can be therapy. I recently read a book, and one of the things that surprised me was how much fear people have about cooking. The Sorted team has the same goal. Get into the kitchen and cook. The videos on Sorted are really fun, they have a video for each recipe, and they are geared towards new cooks. I get a lot of college kids (which I love!) and these recipes are perfect for you. Some of the most fun I had in college was cooking with my friends and having dinner parties. In fact, the first Thanksgiving dinner I ever cooked was in college. This Deconstructed Chicken Kiev is honestly the best dinner I have made in a long time. If you have ever been to a banquet of some sort, you have had Chicken Kiev. It is typical wedding food. It is usually a chicken breast stuffed with garlic butter. It is good, but this version is brilliant. The Sorted boys had the idea to put the stuffing on the outside, and it creates the most delicious and flavorful crust. I had the butcher cut my chicken breasts in half, so these cooked in about 15-20 minutes. While they were in the oven, I made a quick tomato and olive salsa, and dinner was ready in no time. I roasted some baby potatoes, and put the chicken on a bed of mixed greens. It was heavenly. My husband took the leftovers to school the next day and he was the envy of his classmates. This is not an exact recipe, you can make it for 4 people or 20 people, just taste as you go, and it will be great. 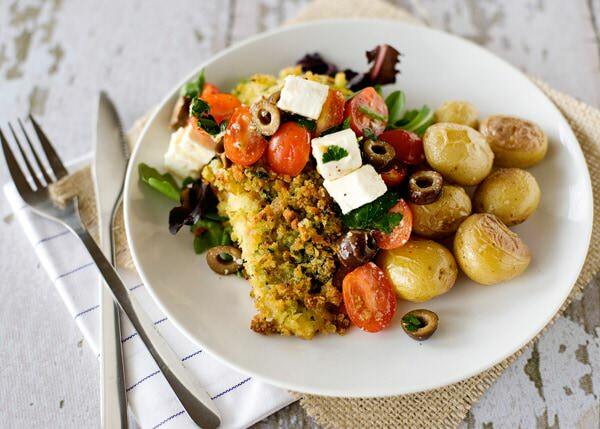 Watch the Sorted team make this Chicken Kiev here. 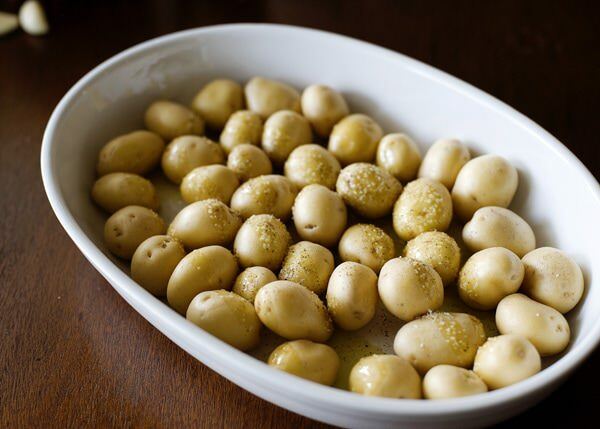 Toss some baby potatoes with olive oil and salt and pepper. Roast in a 400 degree oven. They will take about 20-30 minutes total. Get these started and you can add the chicken to the oven and they can cook at the same time. 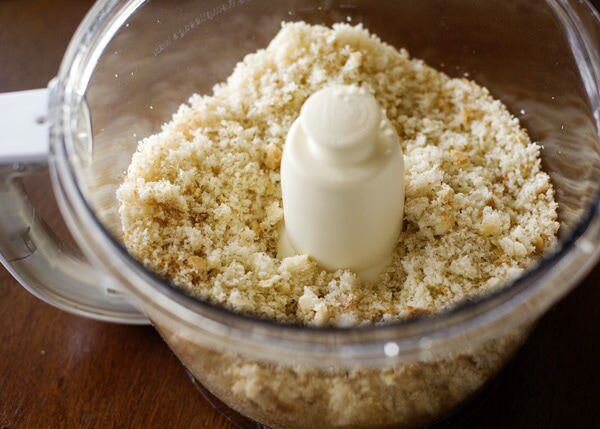 Add the bread to a food processor. I had a gorgeous loaf of Italian bread, so I used that, but regular white bread is just fine. Pulse until it turns into crumbs. 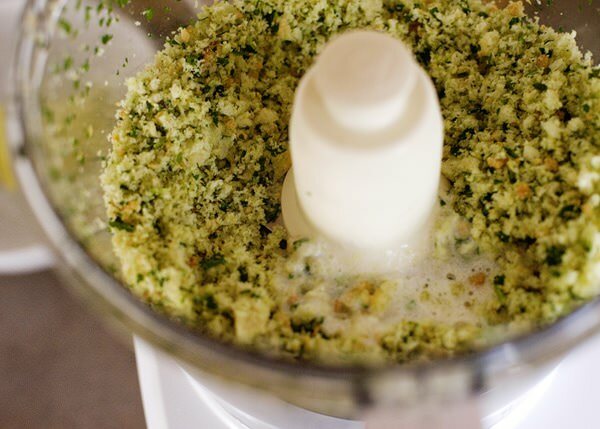 I am lazy, so instead of chopping garlic and parsley, I dumped the breadcrumbs out and pulsed the parsley and garlic until it was chopped fine. 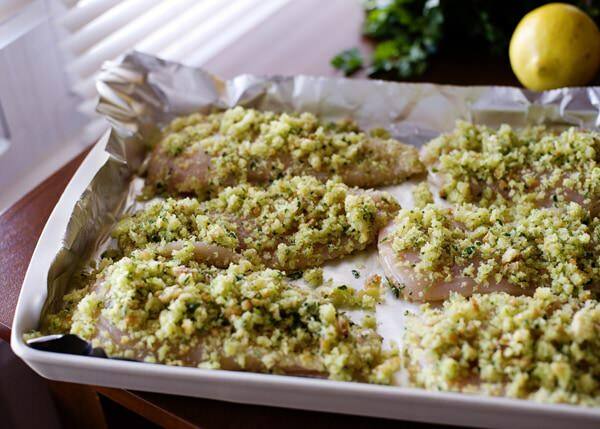 Add the breadcrumbs back, and pour in the melted butter. Pulse again until it coats all of the breadcrumbs. Set up a little chicken breading station. 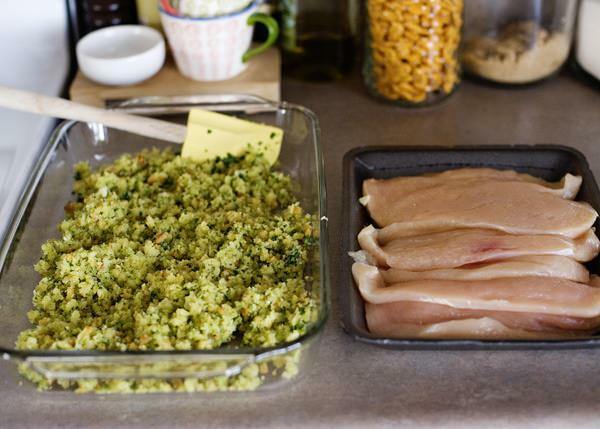 Press the bread mixture onto the chicken breasts. Put the chicken into the oven with the potatoes and bake until cooked through, about 15-20 minutes. 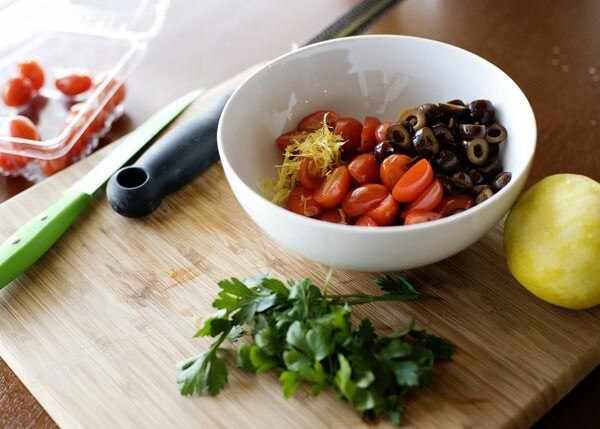 Meanwhile, halve the tomatoes, and toss with olives, the zest of a lemon, and Tablespoon or so of olive oil, salt and pepper, and some chopped parsley. 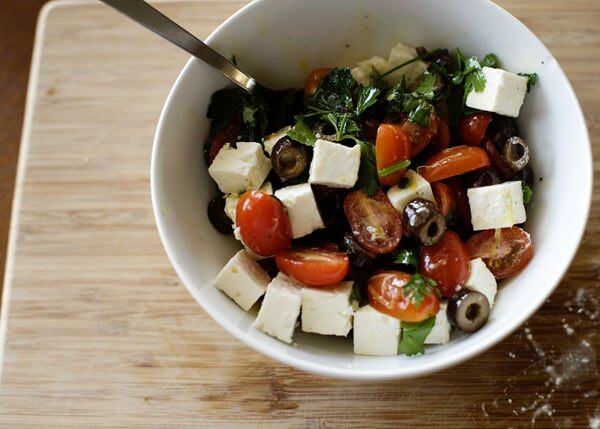 Add some feta cheese. Set aside. Layer some mixed greens on the bottom of the plate. Add the chicken breasts, and the tomato and olive salad. 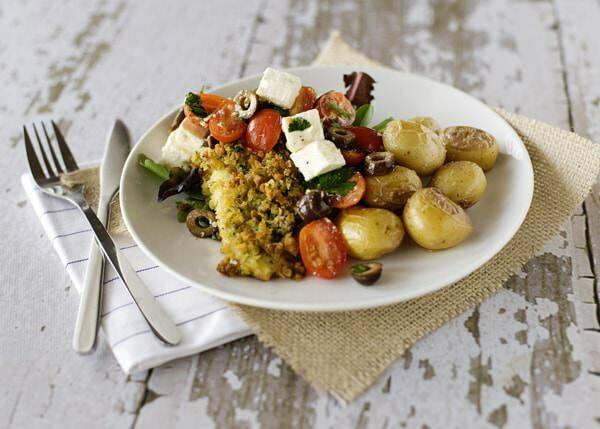 Serve with roasted potatoes. I assume it tastes delicious from your description, but I just wanted comment on how beautiful and colorful the dish is! thank you so much Brandon! Deconstructed Chicken Kiev! What a fabulous – and seemingly easy – recipe. My goal is to motivate friends to get into the kitchen as well and that is why I love your blog. I send people your links regularly. The step-by-step photos demystify the recipe, so I try really hard at that as well. The challenge is taking the photograph of something that requires two hands! 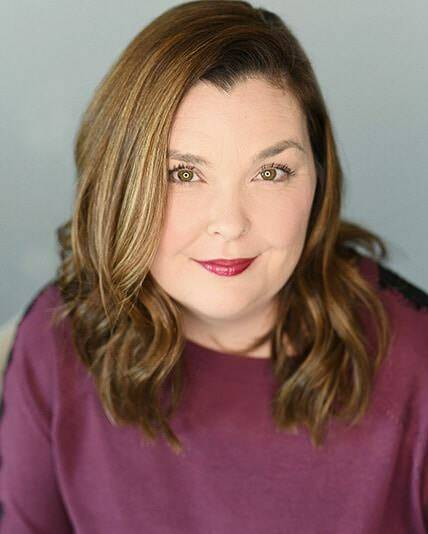 Thank you Stacy! This recipe is so easy and so good. On heavy rotation at this house. I don’t even eat meat, but I’m tempted to make this dish for my family. It looks so easy! Thanks Bree, you make me want to cook more. (I bake more than I cook.) Plus, I looooove potatoes. That is such a nice thing to say! Oh goodness!! I sent your recipe to a friend of mine last week and they had me over for dinner last night to try it out. I loooove the balance of the crusty chicken with the warm potatoes and the cool tomatoes. We used goat cheese instead of feta and the creaminess of the chevre made it so awesome. My favorite part is the little punch that the lemon zest gives the salad. 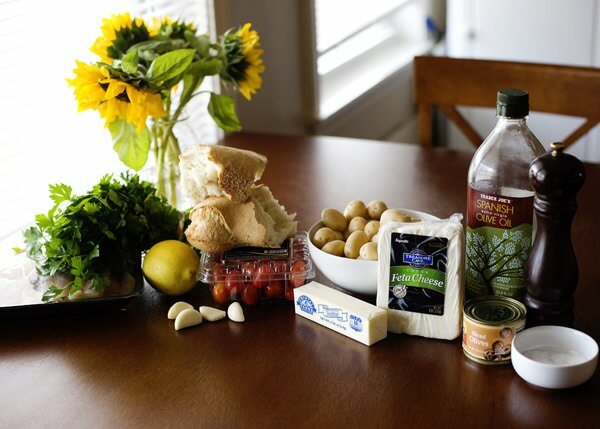 Thanks for sharing with us…it instantly went into the fav recipes pile! I love this recipe too. Perfect for so many occasions too. 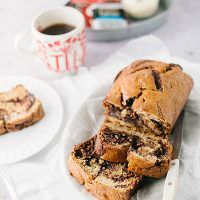 This is an easy recipe that tastes delicious! A dinner that pleases two teenagers who have very different tastes and my husband loves it too! 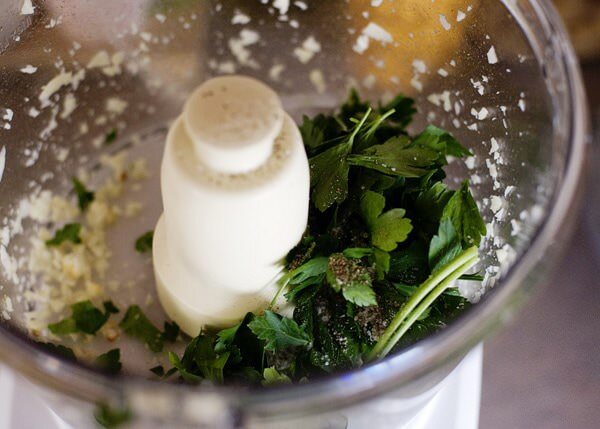 Love the tip about putting the parsley and the garlic into the food processor. Thanks for another great addition to my dinner rotations! I love this recipe too! I haven’t made it in awhile, I should add it soon. Glad everyone liked it so much.